I’m thankful to Chris Maisano for crafting together this statement on electoral strategy for the American Left, and I’m proud to have added my signature to the statement, along with 74 other DSA comrades. But if we want to move beyond the cycle of mobilization and retreat that dominates left electoral activity in the US, we have no choice but to build our own political formations, as difficult as that will be. They will have to do what all parties do – run candidates for office, particularly in states and localities where competition between Democrats and Republicans is low. Considering the many institutional barriers to effective independent politics, they will also have to launch fights to change ballot access laws and other measures aimed at maintaining the two-party duopoly. Note: This is another short post about my personal political journey thus far, and about some efforts to help build an effective American Left in the 21st Century. Views and characterizations are my own. I do not speak for the organizations mentioned, nor for of any of my comrades. As always, comments are welcome. I’ve written previously about my political awakening which began in earnest a few years ago. Early on, I recognized the need to work together with others toward fundamental change. One of the things that I did was to join the Wobblies. I remain a faithful dues-paying member of the IWW, and now also carry a National Writers Union card. Union membership is something that I consider to be part of my core identity. I also began to learn about political organizations on the broader left. There is a dizzying range of them in the United States. There are Social Democrats, and Democratic Socialists, and Feminist Socialists, and Committees of Correspondence, and Spartacists, and Trotskyists, and Marxists and Revolutionary Socialists and Anarcho-Syndicalists, and Christian Anarchists – and many, many others. I studied lineages and politics and structure and governance and international affiliations and a host of other details about each group. The two organizations of most interest to me were the Democratic Socialists of America and the International Socialist Organization. Both have active Chicago chapters (which was important to me since we were anticipating a move north from Central Illinois to the Chicago Southland), both are relatively large organizations, and both have lineages that can be traced back to the heroes of 20th-century American radicalism. I joined the DSA in early 2012. In the four years since, my political education has continued. Two particularly important influences have been Marx’s writings and Rosa Luxemburg’s Reform Or Revolution. The idea that we cannot merely reform our way to a just society is now evident to me. This doesn’t mean that reforms aren’t important, but that we do have to have strategies beyond that. 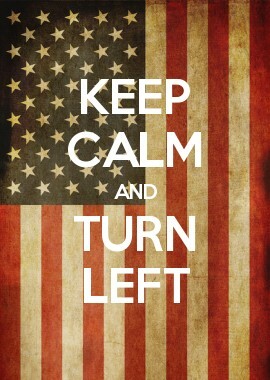 The more I’ve read and learned, the further left my politics have trended. So I was delighted when a friend in another organization mentioned, in passing, the “left wing of the DSA around Jacobin.” Up until then, I had no idea that an organized “left wing” existed. I contacted someone I knew at Jacobin, and they put me in touch with someone involved in the DSA Left Caucus. I was welcomed into the caucus in late April of 2015. Although there is no litmus test nor a point-by-point statement of principles which a member is bound to accept, there seems to be general agreement across the caucus around the following ideas. We’d like to see a greater focus on education in theory and history throughout our organization. We are socialists, organizing for socialism. We’re not liberals or progressives or social democrats. We are committed to solidarity with those who are most oppressed under capitalism including women, people of color, first peoples and LGBTQ people. We believe in internationalism, and in showing solidarity with the struggles of oppressed people worldwide, particularly those who are victims of American imperialism. 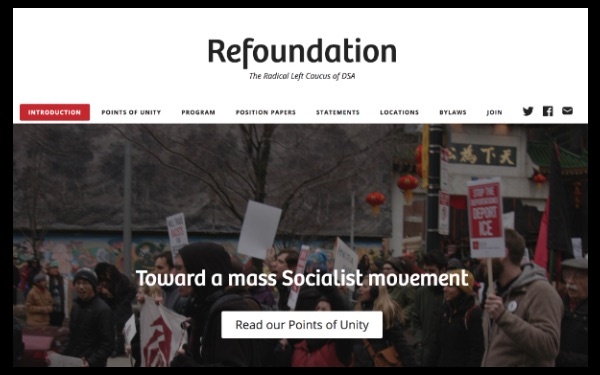 We want to help build an independent socialist political movement in the United States while maintaining a flexible and undogmatic approach to elections in the meantime. 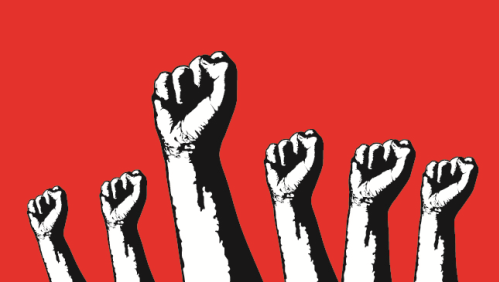 We are committed to building relationships across the American Left, and to pursuing a united front with comrades from other socialist organizations where possible. 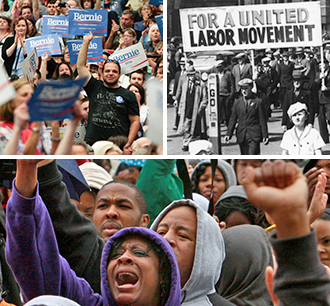 We are committed to solidarity with our rank-and-file union sisters and brothers, and to supporting movements for union democracy. The DSA is not only the largest explicitly socialist organization in the United States, it is one with a rich intellectual and activist history, and a structure that continues to guard against uncritical acceptance of predominant ideas. The Left Caucus provides auspices for thoughtful discussion and purposeful organization toward a more vibrant and effective DSA, and hence a more vibrant and effective American Left. I’m thankful for the opportunity to be learning and working alongside this group of exceptionally bright and committed activists. Bhaskar Sunkara says we should welcome Bernie Sanders’ presidential run, while being aware of its limits. Sanders’s candidacy doesn’t have to channel left forces into what will likely be a Clinton nomination. Instead, it could be a way for socialists to regroup, organize together, and articulate the kind of politics that speaks to the needs and aspirations of the vast majority of people. And it could begin to legitimate the word “socialist,” and spark a conversation around it, even if Sanders’s welfare-state socialism doesn’t go far enough.